North Shore Animal League America’s Shelter Pet Outreach Team (SPOT)* program brings hope and love back into the lives of people who are alone, ill or live in specialized care facilities. 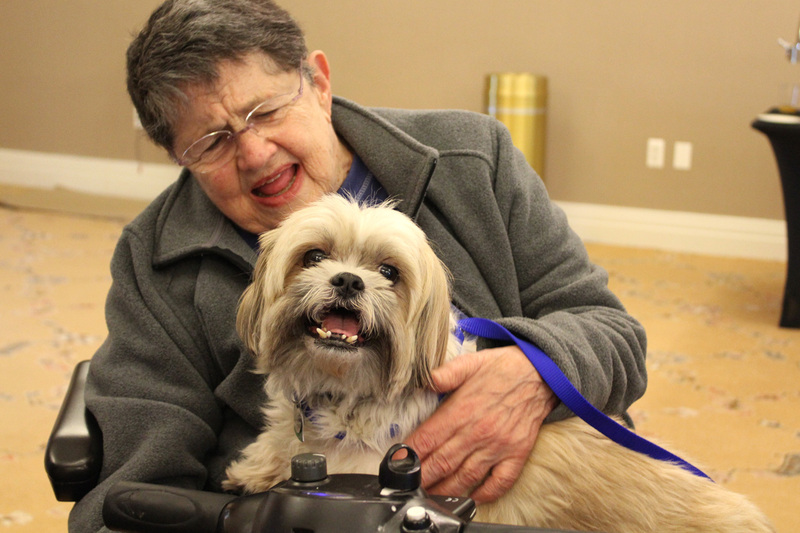 Each week our Pet Outreach volunteers and associates bring puppies and certified therapy cats to nursing homes, senior citizen centers, and rehabilitation centers. These types of animal-assisted activities have been widely recognized to have therapeutic effects, reducing stress and calming anxiety. These lovable animals put smiles on faces, and for those who are no longer able to care for a pet, they can help recall happy memories. Studies have shown that animal-assisted therapy sessions not only improve peoples’ mood, but also helps them recuperate from illness faster, become more physically and emotionally relaxed, and significantly reduces loneliness. A study done in New York, Missouri and Texas nursing homes showed patients’ medication costs dropped an average of 69% when pets were allowed to visit. Animal-assisted activities are not just for seniors. The Animal League also visits Special Education schools in the tri-state area and works with children that are non-verbal, emotionally disturbed, and autistic. The children look forward to weekly visits from the therapy animals and are taught the basics of pet care and safety while interacting with them. They also learn how to give and receive love from a pet. You can help brighten the days of thousands of seniors and children with special needs by supporting the Animal League’s SPOT program. Contact our Shelter Pet Outreach department for more information on our SPOT Program at [email protected]. *The SPOT program is not traditional pet therapy since it is not directed and/or delivered by a health/human service professional with specialized expertise as an integral part of the treatment process. Come meet your new pet in our bright and spacious Adoption Center that features about 350 adoptable cats, dogs, puppies and kittens every day.